Thomas Sorensen was the villain once again in a Midlands derby as his goalkeeping error set Birmingham on their way to victory over Aston Villa. 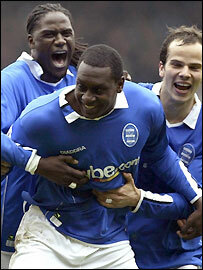 Sorensen allowed Emile Heskey's strike at the near post to squeeze under his body early in the second half. Julian Gray then ensured victory for Birmingham, slipping the ball past Sorensen after some poor defending. Nolberto Solano had almost put Villa ahead with a free-kick that Maik Taylor tipped on to the post. Birmingham completed the double over Villa for the second time in three seasons - and Heskey's goal continued a disturbing trend of mistakes by Villa keepers in matches against Blues. Sorensen misjudged a shot by Clinton Morrison earlier in the season at Villa Park, while Peter Enckelman completely missed a backpass from Olof Mellberg that rolled tamely into his own net in 2002. But victory was no less than Birmingham deserved. Steve Bruce's team had stormed out of the traps, hustling Villa and making all the early running. Walter Pandiani looked particularly lively, hooking the ball just wide after the visitors had only half-cleared a free-kick. Ulises de la Cruz struggled to contain Stan Lazaridis, who made a series of penetrating runs throughout the game. Australian Lazaridis cut inside from the flank and found Darren Carter, but the young midfielder missed the target under pressure. With half-time looming, Villa almost took the lead - Solano struck the woodwork with a curling free-kick that Taylor athletically tipped on to the post with the slightest of touches. A goal would have been unfortunate on Birmingham and Damien Johnson, in particular, who had been booked for advancing too quickly towards Solano and incurred a 10-yard penalty that had taken Villa to within shooting range. Sorensen's mistake ensured Blues did break the deadlock shortly after half-time, the ball squirming under his body at the near post after Heskey had shrugged off Martin Laursen and taken the ball wide of Mellberg. Sorensen lay on his back staring at the sky for several seconds afterwards. But the Denmark international made an excellent save shortly afterwards to palm away a header from Pandiani. Villa substitute Thomas Hitzlsperger forced Taylor in action with a long-range strike late on - it was Villa's first shot on target of the afternoon. Birmingham sealed victory through Gray late on after Villa spurned several chances to clear their lines, the winger beating Sorensen from 12 yards. Birmingham boss Steve Bruce (on following up the defeat to West Brom): "I was looking for a reaction and I thought they showed what they are all about. "We did everything that needed to be done. We had a bit of luck but derby games are about individual mistakes. "I'd had strong words with the players, they owed the fans a performance and now they are forgiven." Aston Villa boss David O'Leary: "I think that it was a game neither team controlled. "We gave stupid goals away and the breaks did not go for us - they must love playing against us. "They did not do much to outplay us but individual mistakes cost us. Everyone is very quiet in the dressing room and Birmingham have the hoodoo on us."